Corporate Image/Branding: Whether you have an established business or are just starting out, we can help you enhance your company's image. We develop or enhance existing Web sites, create company logos and taglines, and handle the design, content and printing of business cards, stationary or marketing pieces. Message Management: A company’s message is vital to its relationship with customers, employees, business partners and the general public. It tells them who you are and what you stand for. We work with you to craft a message that resonates with each of these groups and find the best way to deliver it. Media Relations: We put the power of the press to work for you by generating positive, ongoing media coverage for your organization. We do this by targeting specific journalists and publications that speak to the audience you want to reach, researching what they tend to cover and giving them stories they can’t resist. Media Insiders: We've media trained more than 100 executives, public relations professionals and government employees to handle news conferences, one-on-one interviews, television appearances and unexpected media encounters. Our interactive, on-camera training makes sure your side of the story is told. Click here for more information. Professional Editorial & Writing: Let's face it, words sell. And poorly written materials make a bad impression, no matter how good your product, service or idea is. Let us create or help you build bold, unique copy for your brochure, website, feature article or company profile. We even provide professional blog writing services to drive traffic to your website. Social Media Management: Our dedicated social media team can create, contribute to or fully control all major platforms. We develop a social strategy and calendar, create content and schedule posts, respond to comments, run advertising campaigns or competitions, monitor and measure results, and provide insightful reports. 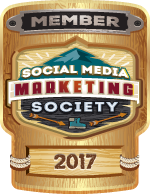 As a dues-paying member of the Social Media Marketing Society of America, we stay up-to-date with fast-moving developments, such as upgrades, algorithms, tools and best practices. e-PR Activities: We apply the latest digital PR technologies including online newsrooms, digital media kits, electronic news releases and Web-based media outlets. We leverage the power of the Internet to deliver your message through leading technology such as RSS feeds, Blogs, Podcasting, and Press Release Optimization. Speaking Engagements: We work with the client to identify organizations with members they want to influence, identify and secure speaking opportunities, and help the client prepare the speech or presentation.